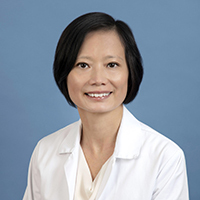 Dr. Sophie X. Deng is a Professor in the Cornea Division at the UCLA Stein Eye Institute. Dr. Deng received her doctor of medicine and doctor of philosophy degrees at the University of Rochester School of Medicine and Dentistry, New York, where she completed the rigorous Medical Scientist Training Program. She did her residency in ophthalmology at the Illinois Eye and Ear Infirmary, Chicago. Dr. Deng subsequently completed her fellowship in Cornea, External Ocular Disease and Refractive Surgery at the UCLA Stein Eye Institute. Dr. Deng is a specialist in corneal and external ocular diseases, and cataracts. Her surgical areas include endothelial keratoplasty (DSEK and DMEK), deep anterior lamellar keratoplasty (DALK), penetrating keratoplasty, limbal stem cell transplantation, artificial cornea and cataract. Dr. Deng is the director of the Cornea Biology Laboratory at the UCLA Stein Eye Institute. Her research focuses on corneal epithelial stem cells regulation, deficiency and regeneration. Dr. Deng’s research aims to improve the current treatment for patients with limbal stem cell deficiency by using stem cell therapy to restore vision. In addition, Dr. Deng conducts clinical studies to develop new imaging and molecular tests to accurately diagnose and stage limbal stem cell deficiency.